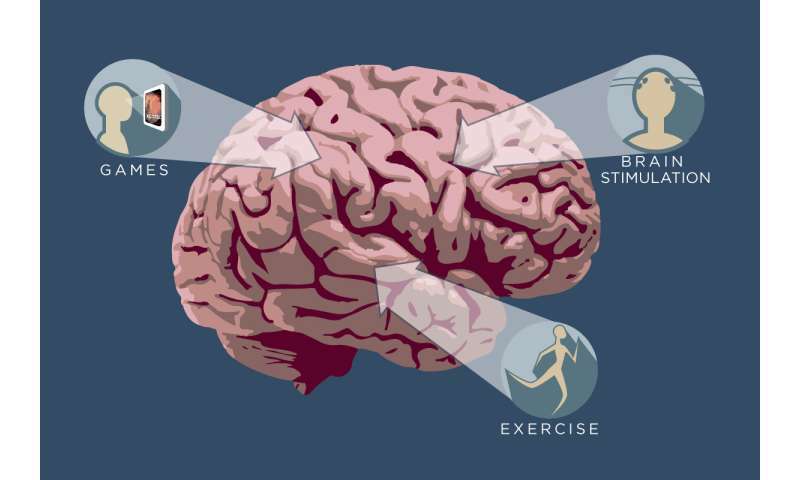 Just as athletes cross-train to improve physical skills, those wanting to enhance cognitive skills can benefit from multiple ways of exercising the brain, according to a comprehensive new study from University of Illinois researchers. The 18-week study of 318 healthy young adults found that combining physical exercise and mild electric brain stimulation with computer-based cognitive training promoted skill learning significantly more than using cognitive training alone. The enhanced learning was skill-specific and did not translate to general intelligence. The study, the largest and most comprehensive to date, was published in the journal Scientific Reports. "Learning provides the foundation for acquiring new skills and updating prior beliefs in light of new knowledge and experience," said study leader Aron Barbey, a professor of psychology. "Our results establish a method to enhance learning through multimodal intervention. The beneficial effects of cognitive training can be significantly enhanced with the addition of physical fitness training and noninvasive brain stimulation." Psychologists have extensively studied and debated the merits of cognitive training, but have mainly focused on computer-based tasks, Barbey said. The few studies that have incorporated other training modalities, such as physical fitness training or noninvasive brain stimulation, have been small in sample size, short in time or narrow in scope, he said. The Illinois study divided its numerous subjects into five groups: three experimental groups and active and passive control groups. One experimental group received only cognitive training; the second group received cognitive training and exercise; and the third group received cognitive training, exercise and noninvasive brain stimulation delivered by electrodes on the scalp. The active control group completed different computer-based cognitive training tasks than the experimental group, but did the same number of sessions of the same amount of time as the experimental group. In the first week, participants took a pretest. In the following 16 weeks, the experimental and active groups completed 90-minute training sessions three times a week. In the final week of the study, all participants took a post-test. "Physical activity and aerobic fitness are known to have beneficial effects on the underlying structures and functions of the brain," said Barbey, a member of the Beckman Institute for Advanced Science and Technology at Illinois. "And research has shown that specific brain stimulation protocols can enhance cognitive performance, prompting us to investigate their effects on cognitive training." The study used six different training tasks, designed to measure specific cognitive skills such as memory, attention and task-switching. In the post-test, the groups that received cognitive training and physical fitness training or all three interventions performed significantly better than the group with cognitive training alone. 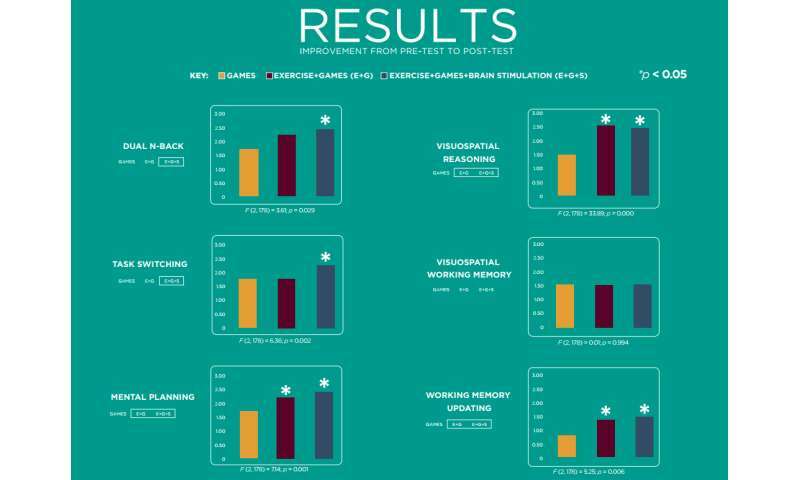 The group that received all three interventions consistently performed the best, and showed substantial gains in two of the tasks over the group that received cognitive and physical fitness training but did not receive brain stimulation. The researchers then gave the subjects different cognitive tasks to perform, and found that the enhanced skills did not transfer to the untrained tasks. This suggests that multimodal cognitive training enhances learning for specific skills, Barbey said, but not for general intelligence. "We can apply this knowledge to develop a personalized approach for each participant, tailoring the intervention to adapt to each person's skills and needs in an effort to optimize the potential benefits of training and to provide powerful new methods to enhance specific cognitive abilities," Barbey said.